Children welcome Santa at HDSA Christmas Party. 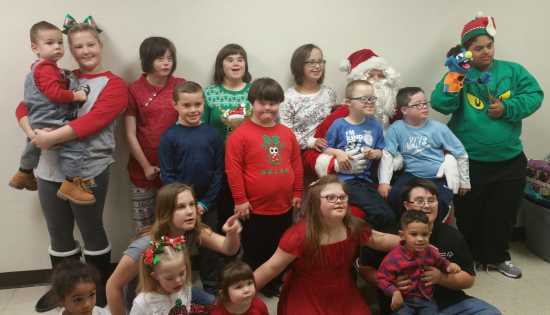 On Saturday, December 2nd, Heartland Down Syndrome Association hosted its 10th Annual Christmas Party in Cape Girardeau. Nearly 70 people, representing 13 families, were in attendance. Santa flew in for a visit from the North Pole to distribute gifts to the children. Founded in 2006,Heartland Down Syndrome Association hosts several fun family activities throughout the year, as well as educational events to increase awareness, understanding, and acceptance of individuals with Down syndrome. Anyone having a family member of any age with Down syndrome is invited to learn more about the organization. Heartland Down Syndrome Association is a community group of the Down Syndrome Association of Greater St Louis. To learn more about HDSA, email heartland_cg@dsagsl.org or check out the group's Facebook page at Facebook.com/HeartlandDSA.